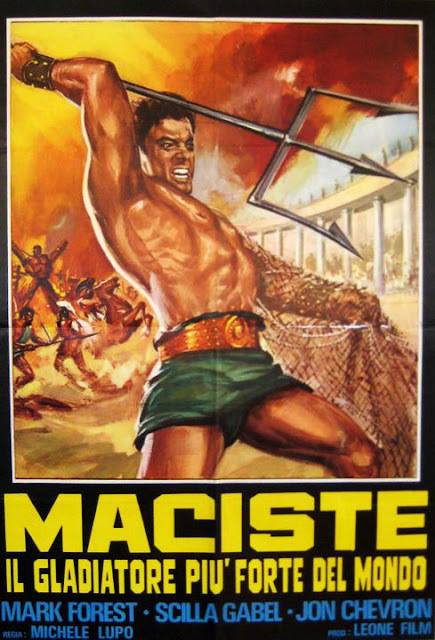 Originally, Maciste wasn't a gladiator. By the time the PEPLUM explosion occurred Maciste morphed into many different type of heroes. When I think of Maciste, I don't think of gladiators (even though he could easily fight and win in any arena). Great poster nonetheless. One of the first appearances of Maciste in the Peplum genre was as the loyal Roman slave in Giovanni Pastrone's silent epic CABIRIA (1914).